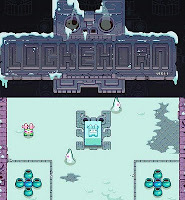 Lockehorn is a new winter themed action arcade puzzle adventure game from nitrome. In a world long past, the big freeze came to engulf the innocent tribe of Elk. Unfortunately, only one survived that mayhem and his name was Lockehorn. Help him defrost his tribe from the big freeze. This game is played with arrow keys to move and push ice slabs around. You must also take precautions - there are evil snow spirits lurking in the frozen temples. To beat this bad spirits, you must push an ice slab at speed to crush them into walls. Once you cleared a level off enemies, place the slab on the altar to advance to the next level. Meanwhile, here is Lockehorn walkthrough showing some levels beaten and the ending.